"I shot this with a Canon 30D on my first weekend out with a new 100-400 IS L. Yes, that's right, the same lens that will have me eating rice & beans for the next 6 months after the Visa bill comes in," says Allan Cunningham. "Years from now I know it will seem a trivial price to have paid for all the neat shots I hope to capture. 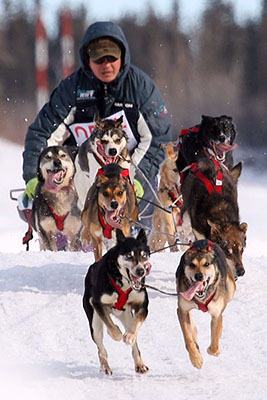 These dog races are events at a winter carnival held every year here in Hay River, Northwest Territories, Canada." Allan set his Canon 30D to Aperture Priority mode at f-7.1 with the resulting shutter speed at 1/1000. The ISO was 200.
a captivating snapshot of lifes drama.